Invite your friends and families, and join the regional, climate activist community, #No2ndBridge group members, and Wild Idaho Rising Tide (WIRT) organizers for the April, third-Wednesday, monthly, WIRT gathering at the Gardenia Center, 400 Church Street in Sandpoint, at 7 pm on Wednesday, April 18. Discussions and action plans include Earth Day and Farmers Market outreach in Moscow and Sandpoint, an oil and gas waste injection well protest and petition presentation in Boise, and ongoing, dirty energy transportation monitoring and reporting. 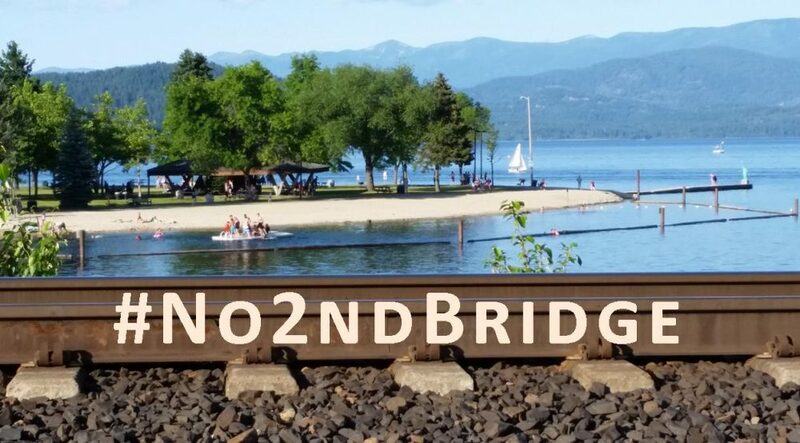 We especially need your participation in work on a #No2ndBridge petition, banner, brochures, comment talking points, Sandpoint rally and demonstration with speakers on Saturday, April 28, information sessions around the inland Northwest, regional attendance and expert testimony at the May 23 hearings in Ponderay and Sandpoint, and summer, direct action training camp, all opposing Burlington Northern Santa Fe Railway track and bridge expansion of the coal, oil, hazmat, and possibly tar sands pipeline-on-wheels across Sandpoint and Lake Pend Oreille in north Idaho. All are welcome to bring their creative ideas and energies and potluck food and beverages, to share current, issue updates and background, and to explore strategies and tactics in support and solidarity with grassroots, Northwest, fossil fuels resistance. At this convergence, we will also view the 2016, Break Free documentary Disobedience, a brief film that describes the global, climate justice movement led by common people taking courageous actions against the power and pollution of the fossil fuel industry, and accelerating the clean energy revolution on the front lines of every continent [1, 2]. Contact WIRT via email or phone, with your questions and suggestions about potential meeting topics and activities. Hosted and sponsored by 350Sandpoint, North Idaho Women, and the Sandpoint Annual Earth Day Festival, this 48th, public, Earth Day celebration and march will highlight local concerns over HiTestSand’s silicon smelter proposed for Newport, Washington, and planned construction of doubled railroad tracks and three bridges across Lake Pend Oreille and Sandpoint [3, 4]. Other event offerings include free health screenings, activities for children, live music, and an Earth-themed, costume contest with prizes for kids aged 12 and younger and adults. Organizations working to keep Idaho healthy, wild, and beautiful, by educating and activating the local community, will offer information booths, voter registration, the Idaho Medicaid petition, and much more. Enjoy and learn with your friends and family, between 12 and 3 pm on Sunday, April 22, at Farmin Park, Oak and Fourth streets in Sandpoint, Idaho. The family, friends, and north Idaho/Palouse community of Nels Peterson lost a beautiful soul on March 21. WIRT activists and supporters knew Nels from the Panhandle Artisan Bread Company and as a drummer with the Moscow Volunteer Peace Band and Henry C and the Willards, who played at more tar sands megaload protests and Annual Celebrations of Wild Idaho Rising Tide than any other musicians. In memory and spirit of the tremendous love, strength, and peace that Nels brought to the Moscow area, his community invites everyone missing Nels during his transition to join with all the lives he touched, in a Nelsebration party in honor of Nels . On Sunday, April 22, at 5:30 pm, the Moscow Volunteer Peace Band will gather at Friendship Square in downtown Moscow, and proceed to the 1912 Center, at 412 East Third Street in Moscow. From 6 to 9 pm there, Henry C and the Willards and The Intentions will perform live music shows, Moscow Brewing Company will provide beer and wine, and participants may bring dishes of food to share. In August and September, 2016, six Spokane area members of local Raging Grannies and Veterans for Peace chapters blocked coal and oil trains, with two acts of nonviolent, civil disobedience [6, 7]. Police arrested and charged all six protestors with trespass and obstructing a train. Five pled guilty, for various reasons, at summer 2017 hearings in Spokane District Court. Only Reverend George Taylor chose to move forward with his case to jury trial, and filed a motion asking Judge Debra Hayes to allow his attorneys to present a necessity defense, arguing that he committed one harm to prevent the greater health risks, environmental dangers, and imminent harms of fossil fuel train pollution, derailments, explosions, and fires (like in Mosier, Oregon, on June 3, 2016) and of their cargo’s combustion, greenhouse gas emissions, and consequent exacerbation of climate change. At a June 26, 2017 hearing, the court heard testimony supporting George’s necessity defense, by Dr. Steve Running, professor of global ecology at the University of Montana in Missoula, and co-author of the Fourth IPCC Report on Climate Change, for which he shared the Nobel Peace Prize, and Tom Hastings, assistant professor of conflict resolution at Portland State University, and author of several books on civil resistance. Climate change expert Dr. Running stated that, “The production, transport, and use of these fossil fuels for energy is the single greatest threat today to the survival of civilization as we know it. We must stop this dangerous practice, and switch as quickly as possible to more sustainable sources of energy, such as wind, solar and hydro.” Reverend Taylor also testified about his blockade motivations at an August 21, 2017 hearing. On March 8, 2018, Judge Hayes issued an order allowing George’s lawyers to present the necessity defense to a jury, to justify his alleged direct action, at a trial scheduled to start April 23, 2018. Among numerous findings in her order, she noted that governments and industries have long known about but have failed [or delayed and thwarted efforts] to abate the greenhouse gas emissions causing climate change and the resulting, severe, imminent, and irreparable harms to regional citizens and the international community . She also recognized that, after citizens have unsuccessfully attempted every legal means to force institutional, corporate, social, and public policy changes, their civil resistance breaking laws to uphold higher laws has effectively achieved historic victories, such as racial desegregation and women’s rights, and could similarly accomplish environmental protections and stop destruction of the planet and all species. Judge Hayes found it reasonable to allow a jury to decide whether the worsening, adverse harms of catastrophic climate change – hotter temperatures, extreme weather patterns, erratic wildfires, devastating hurricanes, rising sea levels, disrupted ecosystems, compromised, essential resources like water and agriculture – outweigh George Taylor’s resistance action. But on March 30, the Spokane County prosecuting attorney appealed Judge Hayes’ ruling. According to lawyers representing George Taylor – Karen Lindholdt and Alana Brown of Spokane, and Rachael Paschal Osborn of Vashon, Washington – Spokane District Court has indefinitely postponed his jury trial, pending Washington State’s appeal of Judge Debra Hayes’ ruling allowing his climate necessity defense. Please contact WIRT to assist organizing carpools to this Spokane jury trial, when it occurs, to observe and support fellow, fossil fuel infrastructure and transportation blockaders. With sincere gratitude for your daily contributions to climate activism!